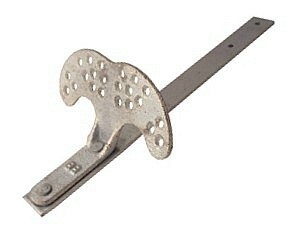 DESCRIPTION: A very heavy duty durable, plated iron casting and bar assembly designed for slate roofs. The riveted steel bar is 1/8" x 1" x 12" long and goes 8" under the slate and between the slate course. OPTIONS: Available in bronze (SGBR-2, or Galvanized Malleable iron (SGML2).